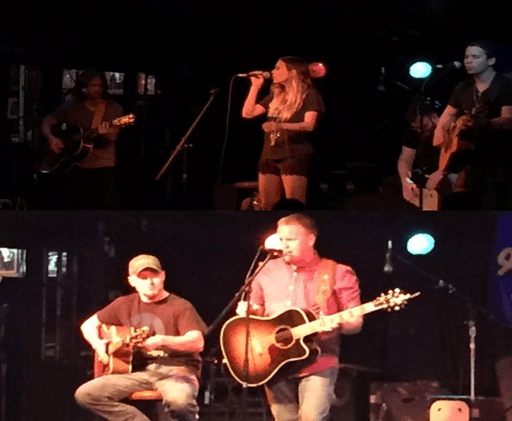 I had the privilege of attending the concert by Nashville artist Jana Kramer at the Music Ranch last night. You might know Jana by her huge singles, “I Got the Boy”, “Love” and “Why Ya Wanna?” and also her acting career in One Tree Hill. The purpose of the event was to thank the generous people who donated at the Saint Jude Children’s Hospital/97 Country telethon. As you know, Saint Jude Children’s Hospital is near and dear to my heart. I attended the concert because I not only helped answer the telephone during the telethon but I work for Hall Communications, the owner of the radio station. Fortunately, not only did I have my guitar in my pick-up truck, but also my lead guitarist was at the concert and he also brought his guitar. I ran out to my truck, took off my 97 County shirt and put on my “concert” shirt. In just a few minutes, the two of us were in concert. It pays to come prepared for any eventuality!